The noise of human existence emanates from each brush stroke of Daisy Parris’ work. Colour and bold strokes enrich her collections with texture and expression that pave the way for an experience of art founded in the physical, and refined in an existential space. The elements of each painting silently, violently construct a portrait of the daily battles of identity which mankind faces. Her work is tangible and vocal, and layers of caliginous energy lurk below the surface: representing an intense and habitual internal conflict in her audience. 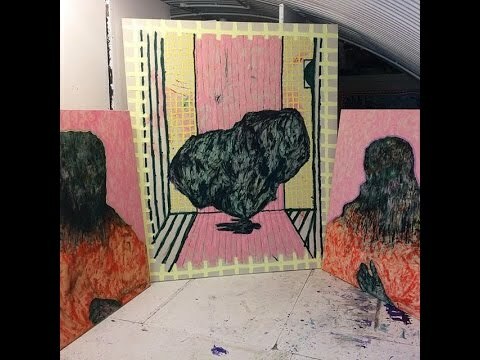 Armed with a molotov cocktail of traditional oil paints, oil pastel and the destructive flare of a modern artist, Daisy’s voice is translated into a language of abuse and impatience.Her paintings exude a sense of mania, welded with a probing stillness that inspires a thoughtful tone. When absorbing her work, it becomes clear that Daisy is an artist who exists to paint. Her exploration of the world impregnates your own, enriches it, and gives birth to a stasis of violence and serenity: a human equilibrium.